Utah, sure, where else would you be goin?! That should be the state’s slogan. It is one of thee most beautiful places on earth. It’s like the Grand Canyon and Ayres Rock mated and produced offspring more mind blowingly impressive than ole mater and pater ever were. Americans bandy the word ‘awesome’ about a lot, I’ve been known to sprinkle it around quite freely myself, but no other word is more apt to describe the God-like wonders that will bathe your senses when you drop down to the Beehive State. Before getting into natures nitty grittys, pay a visit to Salt Lake City (for my thoughts on SLC, check out this post). We spent a hot and happy 4th of July in SLC with our mormon friends F, K and little J (They’re not really mormon but I like to perpetual the myth that everyone in Utah is a flag waving member of the Church of the Latter Day Saints, g’wan ya mad things). Replete with sausages and other scrumptious barbecued fare we waved goodbye (hard to see them behind their flags) and headed off to check out these great adventure playgrounds we’d heard talk of. 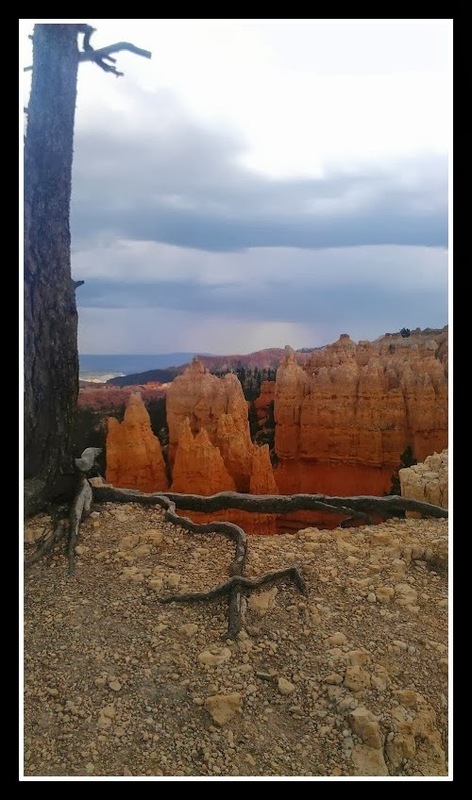 Utah has 5 main National Parks, they get a degree of advertising on national television but these are not just pretty vistas and challenging hikes, these views will sear the retinas off your eyeballs and the ‘hikes’ are adventure trails in God’s back garden. If I worked for the American Tourist Board (does such a thing exist?) I would forget about Disneyland and New York, instead, Utah all the way. 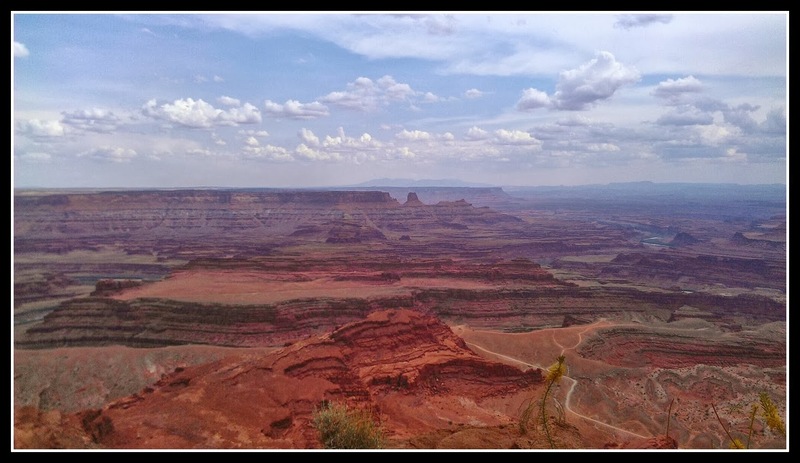 The first park on our list was Canyonlands. Placing too much trust in a wonky sat nav we followed a wee detour that took us literally on the road to nowhere. According to the sat nav we were on something called ‘the Old Road’, it failed to mention it hadn’t been an actual road in about 200 years. We were bouncing along what was essentially a dusty field. Silence reigned in the car as Dom navigated the bumpy terrain and I scanned the massive expanse of complete nothingness. As chief navigator, with a belief in the positive, all I could muster was “Erm, just keep going straight and I’m pretty sure we’ll reach... somewhere. In a way, this is kind of fun...no? !” I was answered by the flash of our fuel gauge. A tense half hour later, we reached civilisation (well, a paved road with a self service gas pump). Phew! Canyonlands, as the name suggests is all about the canyons. (In fact, if you were to follow the canyons you would eventually end up in the biggest of the them, paterfamilias himself, the Grand Canyon in Arizona). 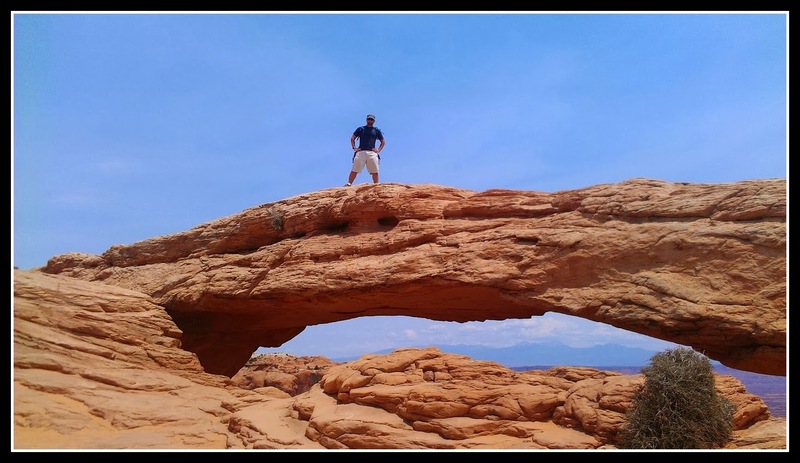 You can walk to the Mesa Arch, the arch frames the canyon below and for the braver souls you can walk across the top of it. It’s two feet wide at the top with a sky scraper length fall into the barren canyon below. Dom, of course, was up in a flash, strolling along, urging me to take a photo and commenting about how sheer the drop behind him was. That, added to the quiet drive through the lost void earlier had my nerves in shreds. It was time for some easier activities. Green River Lookout and Grand View Point Overlook (what’s the difference between a ‘lookout’ and a ‘overlook’?!) frame the bowels of the natural wonder, it’s interesting to note how green the canyon is compared to it’s father in Arizona who has more of a red hew. Before leaving the park swing by Upheaval Dome. Whoops, I nearly forgot to say, if you are a child, have a child or are in anyway easy excited, remember to bring your passport into each park and stamp it with an official park stamp at the tourist centres. It’s like totally cool, like for reals. 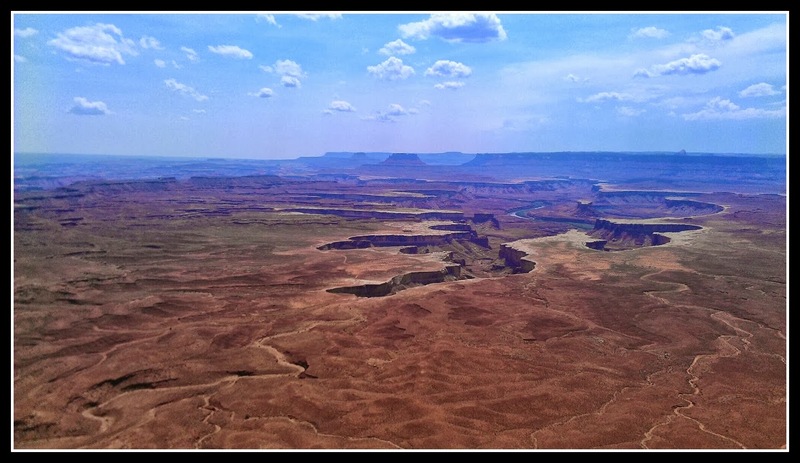 On the way out of Canyonlands you’ll see the Dead Horse Point State Park. A state park is different to a national park, so if memory serves you’ll have to pay into this park. For the national parks you also have to pay, but if you think you’ll hit all of them, then consider buying an annual pass, you can then come and go as you please. Dead Horse Point is a little eerie and desolate but hauntingly beautiful. 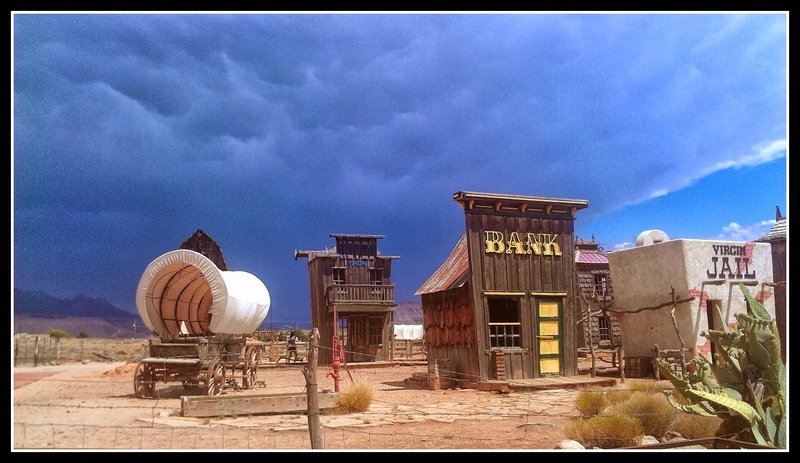 It’s where some of the recent Lone Ranger movie was shot. We pulled up in a desert town called Moab and checked into a motel (it had to be done, Americans in movies are always checking into motels, it’s what the country was built on!). As you enter the town a life size dinosuar smirks at you from the side of the road. Upon further investigation it turns out to be a novel form of advertising for a fossil shop that lurks behind the T-Rex’s tail. If you’re into dinosaur teeth of questionable authenticity and tie-dye t-shirts then this is the store for you. The remainder of the town consists of two streets and can be walked in 20 mins, front to back and up and down. For such a small strip in the quiet desert it has a large number of motels, hotels and fast food joints. So you can imagine our surprise when we followed up on a restaurant recommendation and ended up having one of the best gastronomical feasts of our lives. The Desert Bistro rivals any top Michelin star restaurant in London. The service was impeccable, the food varied and richly flavoured, even the vegan option had me in raptures. I don’t know how this restaurant, with only the desert heat for company, does it, but visiting Moab for this glorious grub is worth the trip. There is more to Moab than one good restaurant, I found it quite charming in a way (once you look beyond the fast food emporiums). This might have been helped by our random decision to visit Woodys Saloon where, lo and behold, Dom cajoled me into a game(s) of pool while we were serenaded by a dixie band. Sometimes the best nights are the unplanned ones. I probably should mention that maybe the reason Moab has so many hotels etc is to cater for park visitors that want little more adrenaline, there were signs for rafting, zip lining, and other things involving safety helmets. 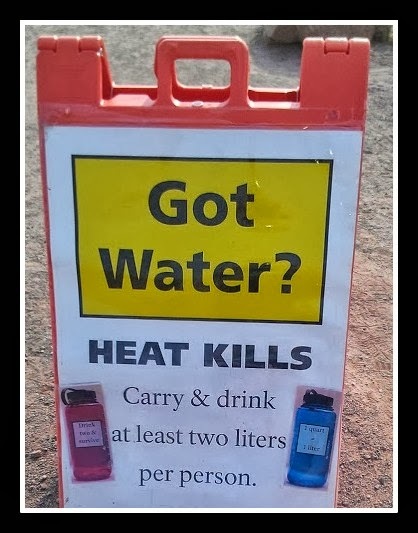 It gets very hot in these parks, lot of signs warn you of how you’re likely to drop dead at any second of dehydration. I would normally laugh at that kind of thing (cos that’s how mean spirited I am) but I actually had a near brush with the grim reaper myself (on a foolish Australian bush walk in 42 degree heat) many moons ago so I tend to take it very seriously. We skulked out of the pulsating sun checking out some impressive boulders on the way. 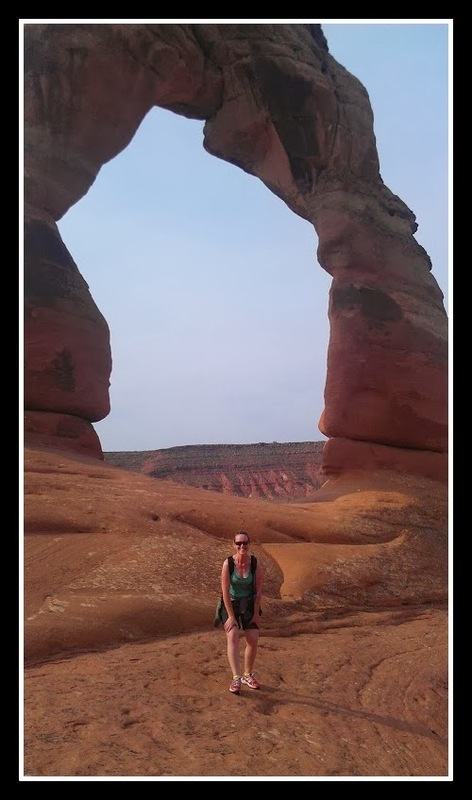 The arch photo snagged on our phones it was off to the next park. Capital Reef National Park was probably my least favourite. It mostly focused on the geological engineering that created the folds of the rocks, it bills itself as a geologists paradise with the slogan “Do you like rocks?”. I would have gone with “Do you like free stuff?”, get the people in then, “Great, let’s start with rocks, they’re free”. A stroll along the rim walk gives you a feel for the topography and even as my least favourite, it is still stunning. Plus the park is on a fault line which is kind of amazing I guess. Bryce Canyon, this is perhaps the most famous of the parks and I think that's where the movie 147 Hours was filmed (the true story about the guy who gets his arm trapped under a boulder for 147 hours, and in order to escape, is eventually forced to hack it off himself. Wow! got to hand it to him!... Aw now... that’s just bad taste!). 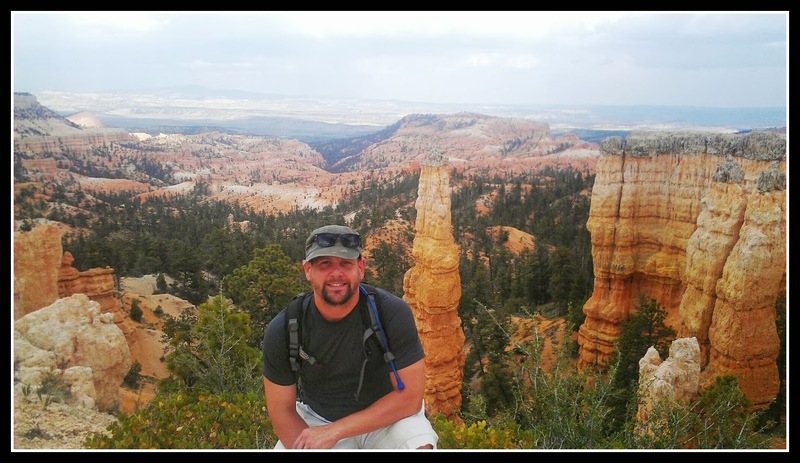 Bryce was possibly my top park, the canyon felt to me like a giant’s chess board, there were rows and rows of spectacularly carved pawns, bishops, rooks, kings and queens, all hundreds of meters high. Carved by natures meticulous hand, the symmetry and elegance would convert even a hardened atheist to a crumbling St Paul on the road to Damascus. We walked from Sunrise Point to Sunset Point. At one of these points I mentally composed Dom’s eulogy as he scampered across a walkway no wider than your kneecap to “touch the other side” ! Something that was going to be noted in his eulogy with bitter irony. Perhaps the reason Bryce climbed to the top of my list is because it had more woodland than any other park, I’m all about the trees. The road that led us from Bryce to our last and final park, Mount Zion, took on a zig-zag fashion that gave me a giddy rush and put me in mind of traversing the Alps. In the rain we slithered into a town called Springdale. It was nestled in the mountains and was aptly sleepy. It wasn’t as dusty with the pioneer feeling that Moab had, but it looked like the kind of place that comfortable people had comfortable holidays. I’m never one to turn down some comfort as I snuggled into our nice large oak bed, no motels in sight. There was no eateries equivalent to the Desert Bistro (will there ever be again I wonder!) but Thai Sapa was a nice spot for pan asian cusine, with a kookie waitress thrown in for extra amusement (“from samosa’s to sushi to Singapore noodles, we got it all darlin’” she didn’t say that but she will in the movie version). 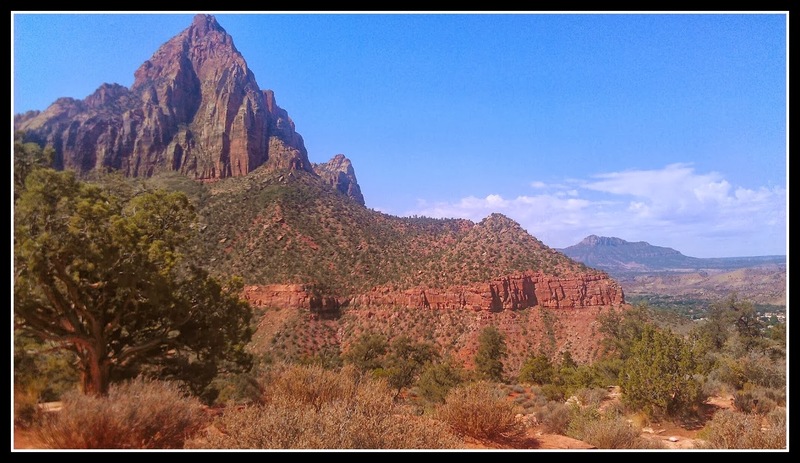 Springdale lies at the foot of Mount Zion National Park, the last of the “Big Five”. Zion was Dom’s favourite as it encapsulated all the elements of the previous four. The main focus of Zion is the river that runs through the canyon. I’d recommend the Watchman Overlook hike, but leave early as it gets hot. It’s uphill so you’re putting in your dues but it’s not just for the uber fit, you can take plenty of rests and blame the exquisite scenery for stealing your breath. 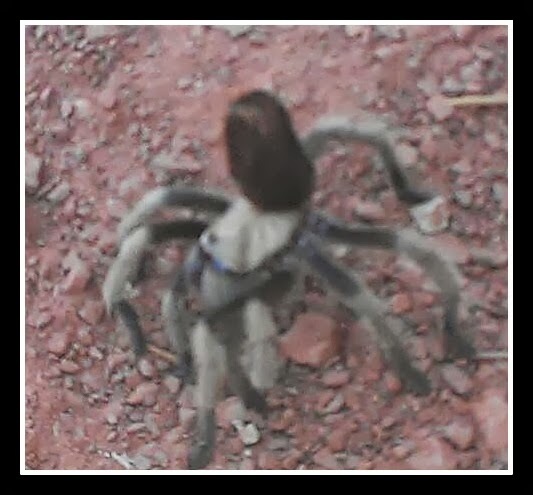 There was another breath taking moment when I stumbled across a tarantula (or if it wasn’t, it was definitely a cousin). Very gingerly, with enough room for the holy ghost between us, myself and t-bomb gracefully danced a side step till the slow set was over and I was the other side of him. Dom who watched with mounting amusement, snapped a photo of the hairy arachnid, hopped over him and on we went. Back at the bottom we sized up our next hike. The sign described a walk called ‘Angels walk’ with a drawing of a man falling off a cliff and the words ‘people die on this walk every year’, pointing left. Below it was something called ‘Riverside namby pamby baby stroll to Emerald pools and little fairy sugar lumps’ or something like that, pointing right. We both looked at each other and with a “well it’s obvious” shrug, in Laurel and Hardy fashion, I walked right, Dom walked left, and bang smack we slammed into eachother. In a scene that probably more resembled mother and child than wife and husband I told Dom he wasn’t allowed on the Angel Walk. Think about it, “Angel” walk, they don’t call it “Survivor” walk or “Alive Person” walk, it’s a death march. ‘Whatever, Mom’ moment over, we skipped along to the super easy Riverside Walk which brings you to the Emerald Pools which are nice and safe and pretty (not a sugar lumps in sight though). Hunger was tickling our tummys so we decided to sadly call it a day, all parked out we headed to recommended Oscars in Springdale for lunch. 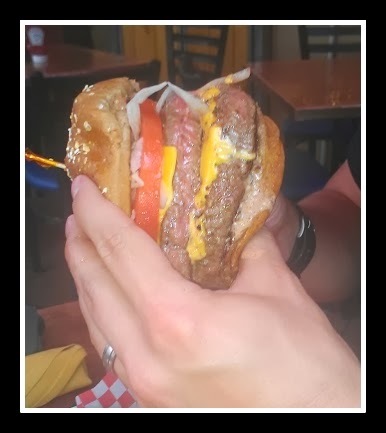 Dom ate a one pound burger the size of his head. It was another great find. 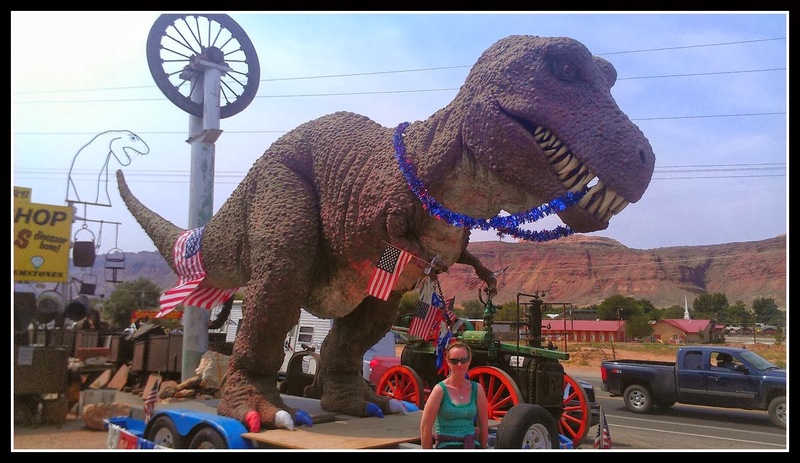 It was time to fly out of Utah, so we drove to the city of St George. The utterly rubbish sat nav let us down once again and lead us to a street that had not yet been built! We completed a tour of St George in an effort to get to their small airport. In my snapshot opinion, it’s a very generic suburban God fearing city with a lot of Mormon Churchs, identifiable by the fact they are generally small and white with a spire. But you know what, travelling beyond the Pale has taught me to never underestimate a place. According to a plaque in the airport, St George was home to a fearless brave young girl called Vicki Van Meter who became the youngest woman to fly east to west across the US at the age of 11, she very sadly passed away by her own hand in her early twenties. World, you keep surprising me. Sounds sensational......that tarantula would have finished me off! The 'Big Five' are a must now!